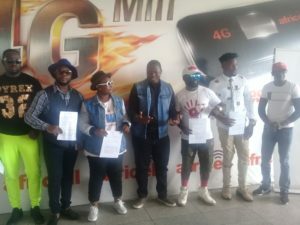 Sierra Leone’s leading GSM operator, Africell Mobile Company on Friday, September 14 announced the signing of six top local musicians as their new brand ambassadors. Collabo, Empress P, Lady Mackie, Wahid, C-Bolt and Pizzy joined other musicians, including Emmerson, LAJ and Kao Denero, among others, who signed few months ago, as brand ambassadors. The musicians are expected, as part of the Memorandum of Understanding signed, to fly the name of the company very high across the country, while the company will provide some funds as well as promotional materials and support in hosting their events. The company’s Chief Corporate Affairs Officer, Joe Abass Bangura, said Africell has positioned itself over the years at the centre stage in providing supporting to the entertainment industry. “We have been doing a lot for the people of this country, especially the entertainment industry. We have supported our local artistes and we will continue to do it. We have been innovative, dynamic and pragmatic in what we do,” he said and added that they decided to have local artistes as brand ambassadors in a bid to help build and nurture their career. Bangura said Africell leads in the area of corporate social responsibility because they have provided support to sports, entertainment, education and tourism, among others. On behalf of his colleagues, President of All Stars, Milton A.S. Coker aka Collabo, thanked the company for bringing musicians on aboard as they strive to lead in the telecom industry at all times. “We jump at the opportunity of being part of the Africell family because of their national touch. They are always with the grassroots, but especially the entertainment industry,” he said and assured that they would support the company achieve great things.